Location : Banks of Mandovi River, Reis Magos village. Main Attraction : Reis Magos fort, Feast of the Three Wise Men. How to Reach : Local transport available in Goa. 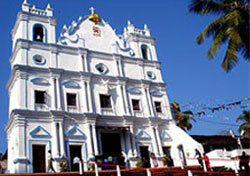 The Reis Magos church of Goa is one of the most famous landmarks of the Reis Magos village located in Goa. This famous church is visible from across the River Mandovi as a white monument that is stunningly beautiful to look at. The church is located on the road that passes the famous Calangute and Candolim beaches. If you go till the Verem Bazaar and take a turn past a Hindu tree shrine, you shall reach the Reis Magos. The Reis Magos church is famous for annual feast that is held on 6th of January and is dedicated to the Three Wise Men. This magnificent church was built way back in 1555. The church is dedicated to St. Jerome. This church was taken over by the Franciscan friars who watched over the missionary work here. They also founded a small educational institution over here. The Reis Magos fort is another famous attraction here that was built before the church was built. It is said that the church was built on the ruins of an ancient Hindu temple. The evidence in front of you in the form of a sacred Hindu symbol that is typical of the Vijayanagar temple style. As you climb the stairs of the church, you get to see the bas-relief lion statues on the sides of the stairs, which is typical of a Hindu temple. The church had much importance during the Portugal rule and in fact two Viceroys of Goa were buried over here and their tomb stones are still present. The church is decorated beautifully inside and is quite colorful, unlike the outside walls that painted in sparkling white. The wooden supports are multi colored and show depictions of the Three Wise Men going with gifts to see Baby Jesus Christ. The altar is quite high and has the above mentioned backdrop. Every year the church hosts the annual feast of the Three Wise Men on January 6th. The locals of the village participate enthusiastically and enact the roles of the Three Kings of Magi. A procession to mark the journey of the three kings begins from the church and goes around the village spreading cheer and happiness.